*Spicy Salt : First of all start mixing some smoked paprika powder (1 tbl spoon ) hot paprika powder (1 btl spoon) rose himalayan salt (1 tbl spoon) and hot chili flakes (1 tbl spoon). Mix all ingredients with a blender. The results will be an hot and flavourful salty powder. **Gold Maraschino cherry: Take a bunch of maraschino cherry and store it in a vase filled up with Cocchi vermouth for few days. Before to use take out the maraschino cherry and let drop the vermouth exceed back into the vase. Cover the maraschino cherry with edible gold powder. Before start to prepare the drink store the cup in a freezer for 20 minutes. Take a huge piece of dark chocolate 70% ( good quality is a must) and temper it. The process is quick and easy: take a small teacup and pour hot water into it. Put a small plate on top of the cup and leave the chocolate on it, after a minute the chocolate will start to melt. Mix half tea spoon of the spicy salt together with the chocolate. Take out the frosted cup from the freezer and soak the glass edge into the melted chocolate, due the different temperature the result will be an hard rimmed edge. Put the cup back into the freezer to keep the consistence and start to prepare the drink. In a well sized mixing glass full of ice pour the Chili gum syrup, the bitter Truth chocolate, the Cocchi Vermouth, and the Woodford reserve Bourbon whiskey. Stir well for few seconds. Take out the cup from the freezer and strain the drink into it. Twist the orange peel and add the goldMaraschino cherry with a skewer on the edge. 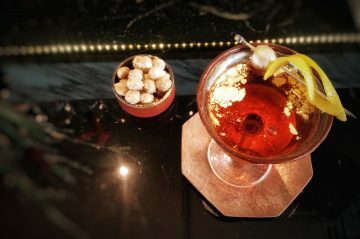 The recipe is a simple manhattan with the chocolate and the vermouth choice playing the main role. SSD Is the glamorous district in Manhattan. Just another place to be.